Tube filaments – should we be heating them with voltage, or with current? Or maybe with a bit of both? Did you ever seen a filament based light bulb fail and end it’s useful life? Blown filament syndrome ? Did you know that 99,99% of such failing light bulbs fail during switch on? Do you see any resemblance between the filament in a light bulb and the filament in an (expensive) audio tube? I do. Well, it just so happens that a cold filament has a very small DC resistance. When you apply the “full” operating heater voltage to the filament, you actually provoke a surge of current that is by multiples higher than it is supposed to be. Such a heavy surge of current rapidly heats up the filament. Sometimes … it is heated up to such an extent that it literally destructs during the process. That is what happens when you heat with a current originating from a “voltage source”. But what if you heat them with a current originating from a … “current source” ? Say that from the very onset, you “program” the current to be exactly what it should be, irrespective of voltages. Like as in a current source. And the easiest way to produce a current source is to use a voltage source, like a “stupid” LM317 that you get for the price of peanuts, … and wed it with a single stupid resistor ( a single peanut). 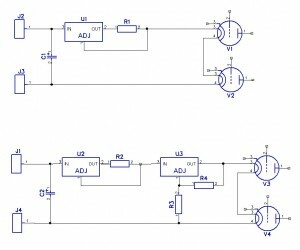 Note that the ADJ sensor pin of the LM317, the one that is associated with an op-amp that is basically comparing the output voltage with a 1,25V reference voltage, is wired slightly different than in the basic application notes. The current and voltage relationships shall be such, so that the voltage drop on the sense resistor shall be exactly 1,25V. As we can use various values of the resistance of this resistor, and know for sure that the voltage drop across it shall always be the 1,25V, we may “program” the current flowing through it by means of selecting an appropriate value of the resistance. c). appropriate cooling of the LM317 is provided for, so that it does not overheat and does not trigger the internal current limiting, thermal protection circuits of the chip. Please also note that the same current, as programmed to flow through the resistor, shall also be flowing through the “load” – be it a single tube, or a string, a daisy-chain of tubes. This feature, when using an appropriately selected resistor value, shall keep the current at exactly the value we choose. If we know, that a certain tube “needs” 250mA of heater current, then we simply use a 1250 mV / 250 mA = 5 ohm resistor to achieve such a current. But what happens when the filament is “cold” ? Nothing new under the sun. The current shall still be 250mA. This current shall SLOWLY heat up the filament, up to it’s final working temperature, but without the “initial surge”. This method of filament heating will result in a slightly longer “waiting time” for the tubes to come up to the proper temperature, but hey, their life will be prolonged. 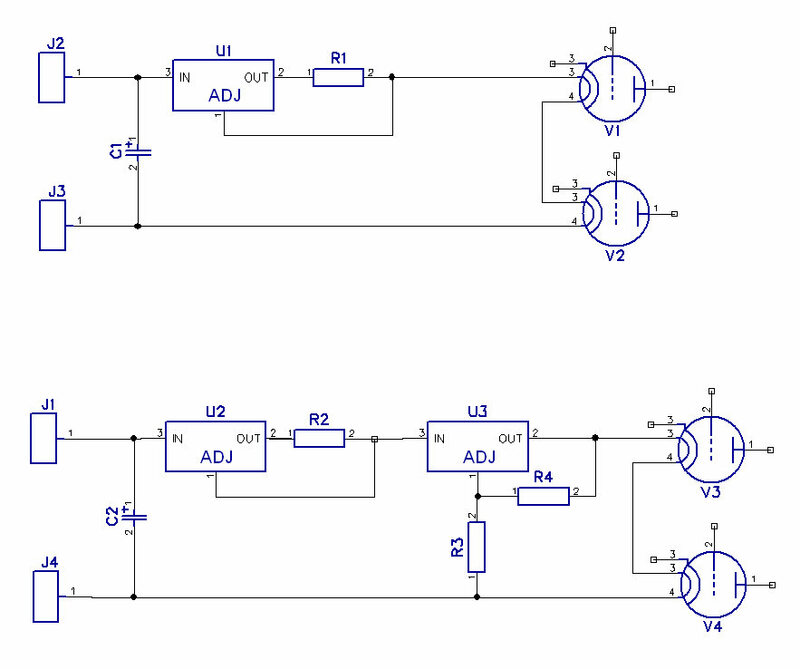 But what about that circuit that I drew as a variation with the TWO LM317 chips ? This is just a tandem of current limiting and voltage control. You simply program the first chip to start working at constant current mode at say 300mA. A current that is by 50 mA higher than the “normal” 250mA that the tubes require. In other words, this first chip is constantly outside of the regulation range, as the currrent normally flowing through it does NOT trigger any current limiting whatsoever. The second chip is a “traditional” setup, where you set the “output voltage” for the tubes. At switch-on, the tubes have cold filaments, and hence have a natural tendency to invite a current surge through the small resistance of the cold filament. The first chip kicks in, limiting the current to no more than 300 mA, which is a reasonable limit. After the filaments heat up, the current limiting portion of the circuit, the first LM317, marks down. It falls out of regulation. At this moment, the voltage stabilizing chip “starts” to regulate, as it falls INTO its regulation range. It starts controlling the voltage on the filaments of the tubes. This setup provides you with a bit of both worlds: voltage drive of the hot filaments, but … initially, a current drive (i.e. a current limiter) mode of drive when they are cold just after switching on of the whole circuit. The net result is that there still is a certain level of “controlled’ current limiting and surge control, but at the same time, the filaments tend to heat up slightly faster. p.s. Obviously, there are lots of methods of achieving a similar result. This one seems compelling and attractive, as it uses a very popular chip, with just a single resistor, to achieve a very nice piece of functionality in terms of prolonged tube life.